So I have been talking a lot about the Blissfest and fundraiser coming up on Oct 18. Well, we are looking for help to run the carnival booths, or donations of prizes for the carnival games. Even if you only have an hour to spare on that day, please let me know when you are available, or what you might be able to help with! It will be a lot of fun so bring your kids and enjoy the day! Thank you so much for your concern and willingness to serve this special family. So the other night I was watching 100 greatest songs of the 90's on VH1. It brought back a lot of memories. Most of my high school memories are attached to music. I have a terrible memory. I didn't used to. I blame it on having babies. But hearing some of those songs made me remember fun times, stupid times, and just left me feeling nostalgic. I hosted a bunco and it was a music theme. I asked everyone who their favorite band was in high school. I had to think really hard but I came up with Weezer. What is your favorite band/song from high school? Any fun memories you would like to share? Here are a few of my favorite songs I had forgotten about: Linger by the Cranberries, Stay by Lisa Loeb & Nine Stories, One Week by Bearnaked Ladies, Two Princes by Spin Doctors, Hey Jealousy by Gin Blossoms, Wonderwall by Oasis, oh and sooo many more! Looks like I will be listening to 1990's music on Pandora for a while! I am blessed beyond belief! I am one proud mama! These are two beautiful girls if I do say so myself! 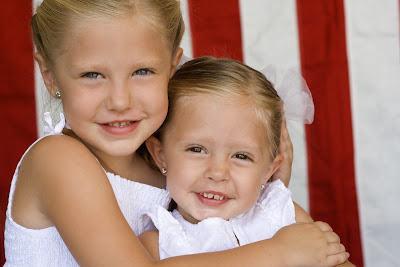 (thank you for the stunning pictures check out this talented lady) I am learning a lot of hard lessons, I might be ready to write about them soon, but for today I am just going to enjoy the blessing of having these two precious girls to love and take care of! I have tried harder to keep my body healthy lately. I have been trying to work out and make healthy dinners for my family. It feels good to take care of myself and my family. The best part is that Spencer and I have been trying to do more things together. We were doing yoga regularly and I felt like it helped to bring us closer together. Last night we went running. Spencer's i pod ran out of power right after we started, so I offered to sing for him, well that was really hard to do while running! So then I suggested we try using one set of headphones and each of us take a side and plug it into my i pod. It was pretty funny, but it worked. And actually it was hard because we had to stay close enough to keep the ear piece in, but far enough apart to be able to move. I felt like we were truly working together and that is always a good thing! I love Spencer so much and am so grateful for all that he does for our little family everyday! I am one lucky lady! There are huge things in the works to help the Nielson family! Please check them out, and see if there is any way you can help! We need lots of help and volunteers for this particular event, please contact us if you are available! Many thanks!